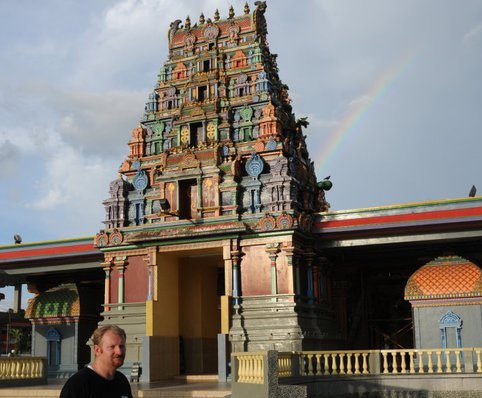 Meet the Fijian Hindustanis – The Other Side of Fiji – Traveling Epic! Fiji is a multi racial and multi ethnic place. In my previous post on Fiji I wrote about the native Fijians and my experience connecting with the locals. The majority of Fijians are native Melanesians. 43% of the population are Indo-Fijians or Hindustanis. Indian indentured laborers were initially brought to Fiji, Indo-Fijian. In the late 1800’s Indians came as indentured laborers to work on the sugar plantations. Most have been here in Fiji for multiple generations. They even have a fusion language. After the indentured system ended, many stayed on as farmers and became businessmen. Now you have the most amazing fusion. Hindu temples on an island jungle with culture, language, and society that is culture and tradition rich cultural island nation mixed with the incredible history of India. A little bit of curry goes a long way to spice up a dish. The colors really light up the place. My friend Michael of sharingtheglobe.com is *really* good at travel. When we put our minds together, we put together incredible adventures. 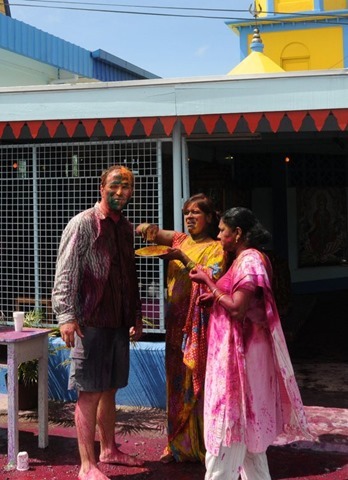 Michael knew that the hindu holiday of Holi was happening. So while the first day of our trip, we knew we wanted to venture deep into the island and spend our time in a village. The adventure began when we woke up on Holi morning. We knew we wanted to find out where the holi celebration was happening. We asked around and some mentioned that the Hari Krishna temple was where it was happening. We tracked it down, and visited it, but while a beautiful building, they weren’t having it there. They told us to go to a different hindi temple. It was there we saw a small gathering. It was the super soaker of purple dyes that really made a mess. We knew as we approached that we were going to get really painted up. Within a couple of minutes, we were soaking with colors of the rainbow. It was fun, exciting, and we joined in music and food. The kids were loving it just as much as the adults. 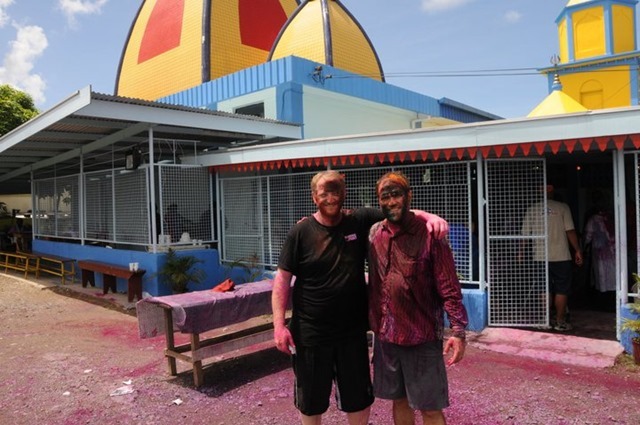 It was after we left the temple that we we driving a long all painted up when we saw a big truck full of Holi day people. The truck was like a large military truck with room for tons of people. We waved and they waved back. They were excited to see follow holi friends and gestured for us to follow them. We followed them as they drove to a house. An older lady answered the door, and the music and dancing began and paint started flying. In western terms it felt like a mix between trick or treating for Halloween, and Christmas caroling, but the colors feel like a mix of easter and a spring water fight. Amazing. I hope you can just imagine the joy we were spreading as we were going from house to house, singing and dancing, and letting go of norms. It was very energizing to let go and connect with these people. In the end we stopped for a round of Kava. The purple dyes would take over a week to get out, but the feelings lasted even longer. I gained a huge appreciation for the hindi people in this experience. The love, the friendship, it was amazing to see the outreach and ability to connect a community. These traditions should be respected. When I found out that not 50 miles from where I’m currently living, the hindu temple has an annual gathering and the community gathers to celebrate with the Hindu people. If you ever get the chance to celebrate holi. You must. It will help you gain a huge appreciation for India, Hindus, and the global culture that has brought spice to the world. 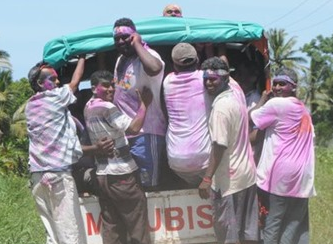 Happy Holi, and I pray for continued peace on the island of Fiji. What an amazing place!! !